For 10 years, Texas A&M oceanography professor and researcher Steve DiMarco has led a research cruise in the Gulf of Mexico, to study and predict hypoxic regions of water. According to the team’s findings, the hypoxic — or oxygen depleted regions of water — were smaller this year, measuring approximately 2,500 square miles. The size of the “dead zone” is what the team had predicted and smaller compared to previous years, DiMarco said. In 2011 the zone was roughly 6,000 square miles and in 2012 it was approximately 2,800 square miles. July defines the official size of the dead zone based on a research cruise organized by Louisiana Universities Marine Consortium, a coastal research and educational facility, DiMarco said. There are three leading factors that determine hypoxic levels — the amount of nutrients present in the water, the amount of freshwater present and overall wind direction, DiMarco said. Hypoxia is important to monitor because of the possible excessive growth of certain nutrients that cause oxygen to be depleted, which could have the potential to collapse an ecosystem, DiMarco said. professor and ocean observing team leader, draw a water sample from the CTD/Rosette. DiMarco said that agricultural practices, such as farming taking place near the Mississippi River, are a leading source for the build-up of nutrients. “The largest area of nutrient build-up we have found is near the Corn Belt around Iowa and Illinois,” DiMarco said. According to DiMarco, greater levels of hypoxia have potential to impact the fishing industry. During the cruise, DiMarco and his research team were equipped with four ocean gliders, torpedo-like instruments that were sent far beneath the Gulf’s surface. Beneath the water, the gliders transmit data, four times per second, back to the ships on the surface, DiMarco said. “These gliders contain both salt and oxygen sensors to help determine the line between fresh and salt water in the Gulf,” DiMarco said. Over the past 10 years the research cruises have given approximately 80 students the opportunity to train on board a scientific cruise, DiMarco said. “Our first research cruise was in 2004 and ever since, I believe we have been making a significant impact in controlling hypoxia,” DiMarco said. 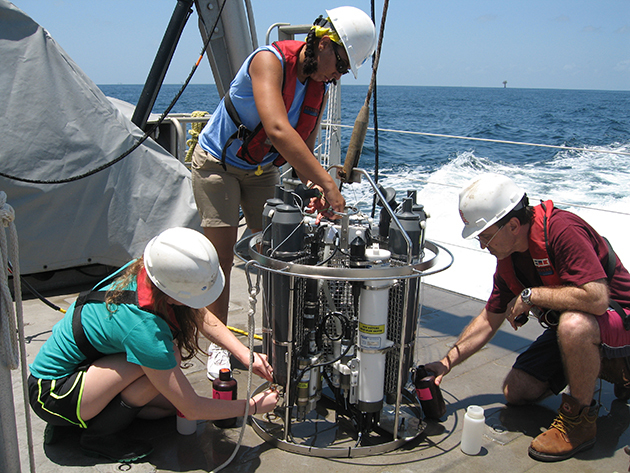 Rebecca Gray, a graduate student at Texas A&M, assisted with the latest cruise in the Gulf. Gray said she tested water samples to help determine the amount of sediments at a particular depth, which determined the line between oxygenated and hypoxic levels of water. Wenxia Zhang, a doctoral student said she has been on the hypoxia cruise twice. Zhang said her role in the study was to collect and analyze data from the acrobat, which was towed at the back of the ship.